Summary: Based on a true story, this World War II novel by Scott O’Dell Award winner Graham Salisbury tells how Zenji, 17, is sent from Hawaii to the Philippines to spy on the Japanese. 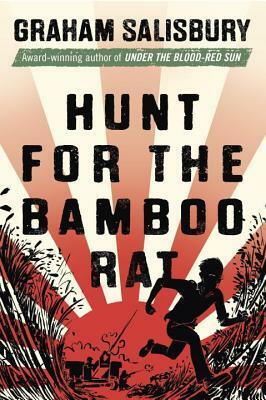 My Review: Hunt for the Bamboo Rat begins with conflict, action, and suspense. From the start, Zenji Watanabe lands in dangerous situations and uses his intelligence and sheer determination to work his way through. He faces adversity using what he has learned from his teacher priests. He thought of becoming a priest himself. He has compassion on others and many times he stands firm and peacefully faces his problems as he imagines the priests would – and there are many problems to address. Zenji runs into street thugs on more than one occasion, he spies on Japanese people, and is trapped behind enemy lines among other dangers. Salisbury keeps the action rolling in this suspenseful survival story. It is a page turner. The overall tone of the book is fairly serious, but there are a few moments of humor. Zenji’s mother writes Japanese poetry that her children translate into English. Zenji appreciates his mother’s creativity. This is a poem that was posted on the wall of the messy room that Zenji shared with his brother Henry. As for the serious side of things, the “enemy,” members of the Japanese military, are generally seen in a negative light. Throughout the book though, readers can clearly see the complexity of humanity and the problem with judging someone by racial stereotypes. There are Japanese who behave honorably and those who behave otherwise. Zenji, being compassionate, tends to believe the best of others unless they give him good reason to change that opinion. One issue I had with the book was the form of English that was used on occasion. One example is a Taiwanese worker in the Philippines. “You no clean good, I whip you,” is one of the phrases he used. What surprised me though was when Zenji then thought or replied in the same manner. He said, “Spotless, I clean um good.” He is a Japanese American who speaks with standard English grammar at most other times. It didn’t really make sense for him to speak like that in those situations, but it happened multiple times. This isn’t a major problem, but it is something that can shake the reader out of the story. I had difficulty finding anything negative about Zenji. He is quite the hero. He has intelligence, courage, compassion, and strength. Recommendation: For those who enjoy war stories and adventure, this book would be a great choice and I would say get it soon. Otherwise, borrow it someday. I’ll have to read the book to see what you mean about the “type of English” used here. If Zenji grew up in Hawai’i, he would have been exposed to pidgin, which would make his dialogue in certain situations. I went to Catholic school in Hawaii and we certainly had proper English grammar drilled into our heads the way Zenji may have had (you mentioned teacher preists, so I am assuming Catholic school). But we definitely reverted to the more prevalent pidgin when out of earshot of the nuns, etc. But I really came by to thank you so much for featuring a book about someone who grew up in Hawai’i. I’m always on the lookout, and this is one that I’ll have to check out. Thanks for the thought about pidgin. That may be what the author was going for since I believe he lives in Hawaii. I’m so glad you stopped by.